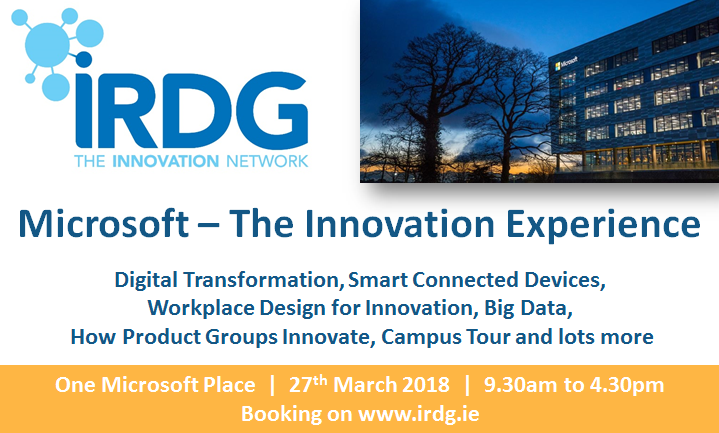 Combining elements of our Innovation Practice Groups and Smart Connected Series, IRDG is really excited to have the opportunity to bring members on this unique visit to Microsoft’s new campus ‘One Microsoft Place’ – a brand new campus reflecting the very latest in global innovative thinking at Microsoft. At Microsoft, their mission and values are to empower every person and every organization on the planet to achieve more. They are now pleased to invite IRDG members to hear about how they enable employees to deliver on this mission internally through their culture, technology and new ways of working in their new campus, ‘One Microsoft Place’. >>> Microsoft Ireland, One Microsoft Place, South County Business Park, Leopardstown, Dublin 18, D18 P521. [Details around directions, Luas transport, parking arrangements etc will be made available to attendees in advance].